Every August, drovers embark on a trip along the world’s longest main street, the 188km Barkly Highway from Mount Isa to the tiny town of Camooweal. Known as the gateway to the Northern Territory, it sits just 13km east of the border. But this tiny town of 208 isn’t just a drive through. Come the fourth weekend of August and you’ll hear the buzz from its Drovers Camp Festival; not just from its surrounding honeycombed caves at the Camooweal Caves National Park. 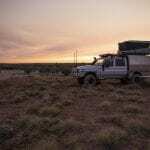 If you’re looking to add a little extra outback flavour on top of a road trip between The Territory and Sunshine State with the Camooweal’s Drovers Festival, then this your guide on how to do it. To get to Camooweal, it’ll take some serious driving – so get your best sing-a-long playlists ready. The 11 hour trek along the Overlander’s Way from Townsville is well worth your time as you travel from pristine beaches through dinosaur centres and historic towns to rugged sunburnt outcrops, without even leaving the bitumen. If road trips are your game, double the fun and motor your way from Brisbane to Outback Queensland’s metropolis, Mount Isa in 22 hours. Slash some time by taking a direct plane trip from Brisbane, Townsville or Cairns to Mount Isa before taking the road from ‘The Isa’ to Camooweal. The extra bonus? You’ll get explore the outback both from a birds eye view and in road trip style. Need more convincing? Here’s 7 reasons to see Outback Queensland from the above. Travel 15km south of town to your not-so-average National Park and you’ll find caves and sinkholes that were formed 500 million years ago as water penetrated layers of rock, creating hollows of up to 75 metres deep. Take the short 70m return walk to the Little Nowranie Cave entrance or the 220m return track to the Great Nowranie Cave for a sneak peak of these natural outback wonders. Got a bike? Take on the park’s internal roads for a mountain bike adventure #outbackstyle. It’s all about the Street Parade on this Friday night. Catch the kaleidoscope coloured floats and big trucks along the main street of Camoowealbefore the Ozzie Outdoors Last Great Mail Race kicks off. . In teams of four, two pull a mail cart with one of their team members inside ready to collect a mailbag from a postmaster. Further down the run, teams pick up their passenger – aka fourth team member. With $500 and an extra $500 for your chosen charity up of grabs, the race is then on to deliver the mail and your passenger to the finish line. Feeling hungry? Head to the Drover’s Camp Kitchen (aka food canteen) to fill up for the day. See local horse riders in action at the bronco branding, a popular outback horse event. What’s bronco branding you ask? It’s a sport that involves a catcher, roping a calf in a mob of cattle and leading it to a brand for team members to secure and mark it. Want to know the tricks of the trade to camp oven cooking? Learn how to cook a classic Aussie damper to perfection to impress your camping mates or caravan neighbours. A night out in the outback isn’t complete without some foot tapping and tunes. This year’s performers include Tom Maxwell, Bruce Lavender, Chicko and the Breakaways, and Tim Sheed and Christine Middleton. Walk up’s are also welcome, so if you’ve got a country singer hiding deep down, here’s your chance to belt it out. A free guided tour of the Droving Heritage Centre will get you up to speed in history of Australian droving (without hitting the books). The droving era of Australia is being preserved here at the centre and recognises the contribution of drovers to the development of Australia’s cattle industry through memorabilia and artwork. While you’re there, check out the photography exhibition, listen in on some bush poetry and give whip cracking a go. Fuel up and stock up on some snacks. Head east towards Australia’s Rodeo Capital or travel over the border (we won’t judge you on taking a selfie at the border crossing, we promise) for your next adventure. Have you been to the Drovers Camp Festival? G’day Mate, 23rd – 25th August in 2019. Hoping you could tell me what year it was that Keith Douglas recited the poem he wrote about Luke McCall please? Hoping that you can tell me what year it was when Keith Douglas recited his poem about Luke McCall. No, but absolutely love the drovers camp Camooweal. Volunteers do a great job. When retired i will be back hopefully for a festival.